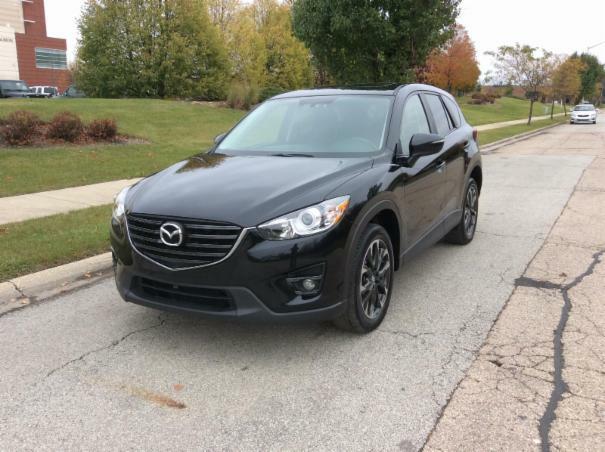 This 2016 Mazda CX-5 Grand Touring is a small crossover SUV with a fuel efficient 4 cylinder engine, a beautifully appointed interior with black leather seats, and plenty of outstanding features. This edition has a terrific exterior color, is super clean, extremely sharp, and drives very well. The CX-5 has sharp styling, AWD, car-like handling, and is fun-to-Drive and easy to maneuver. Options include a sunroof, voice navigation, power seats, windows, mirrors, locks, alloy wheels, Toyo tires, dual climate control, heated seats, roof rails, rear spoiler, dual exhaust, keyless start, a Bose premium sound system with AM-FM stereo with satellite radio and CD player.